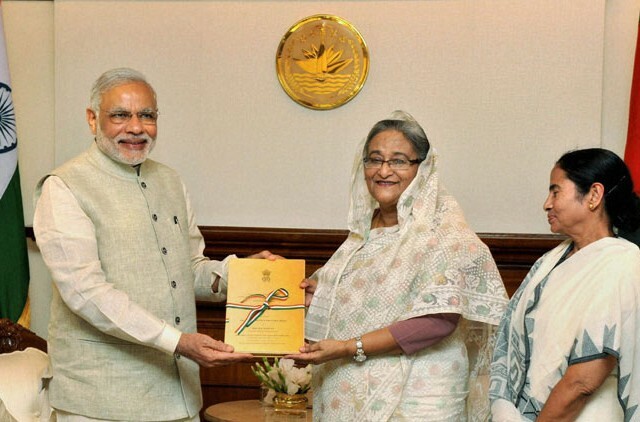 DHAKA – Seen as victories for Prime Ministers Narendra Modi and Sheikh Hasina, India and Bangladesh signed a landmark agreement, sealing the 4096 km Indo-Bangla border forty-one years after talks began. Under the deal, some 200 stateless enclaves near the borders were swapped, giving their population of roughly 52,000 a national identity. For more than four decades the inhabitants of these islands of foreign territory inside India and Bangladesh have been deprived access to public services and many have live under wretched conditions, as a result. The land accord was originally agreed in 1974 by Indira Gandhi of India and Sheikh Mujibur Rahman of Bangladesh. Progress stopped for a long time, however, after Mujib (as he was commonly known) was assassinated in 1975 and subsequent governments remained deadlocked on the land transfer issues. Hasina was deferential to her Indian guest and expressed gratitude to the people of India, saying: “I salute all the citizens of India for supporting this bill in parliament. In Modi’s two day visit, this was merely the tip of the iceberg. Bangladesh agreed to let Indian vessels use the ports of Chittagong and Mongla substantially burnishing connectivity between the two nations. No longer will Indian ships be required to take a circuitous route to Singapore to offload cargo on to vessels that bring them back to Bangladesh – a process that can take over a month. This agreement will accelerate shipping activities four to fivefold, keeping it within a week. And, it marks the first time in their young histories as independent nations that the two will utilize their common seas. Seaborne cooperation had stopped abruptly post-1947 after India’s eastern neighbour, then part of Pakistan became a subcontinental rival. While the liberation of Bangladesh changed the dynamic between New Delhi and Dacca (as Dhaka had been known then) shipping routes remained unchanged. For Modi, this is a major foreign policy victory, which some pundits are likening to the demolishing of the Berlin Wall. It bodes well for Bangladesh, also, after perceptions that Islamic extremism is taking hold and putting a damper on trade and investment. Indian conglomerates announced a huge investment in the power sector just over an hour after Modi touched down in Dhaka. Reliance and Adani Power, signed Memoranda of Understanding (MOUs) with Bangladesh’s state-run electricity agency to invest some $5bn in the country’s shaky power sector. Reliance Power also said it has signed a deal with Bangladesh Power Development Board for setting up a 3,000 mw liquid gas-fired plant and a floating terminal for importing gas in ships to power the unit at a total investment of $3 billion. This would be the single-largest foreign investment for Bangladesh. Days earlier, Foreign Minister, Ali had told reporters that the Awami League government planned to more than double its electricity imports from India to 11,000 MW by 2017 from 5,000 MW now. Modi echoed the commitment from the Indian side. The two countries are looking to boost trade and as well as increase security along the border. They also want to make inroads into joint cooperation to combat human trafficking. India’s announcement of a $2 billion new credit line to Bangladesh follows a $1 billion assistance package it provided in 2011 for infrastructure development. Emphasizing connectivity, the two prime ministers, along with the Chief Minister of West Bengal, Mamata Banerjee, also inaugurated bus services along the border. The service is a boon for Bangladesh, which would be able to use Indian territory to access markets in Nepal and Bhutan. But the service also benefits West Bengal’s capital, Calcutta (Kolkata) by providing a road link to India’s North Eastern states. During the 2014 general election, Banerjee raised the Teesta as an election issue, stating: “Teesta has dried up and there is an acute drinking water problem. Yet, the central government was giving away the Teesta waters.” She also urged the people to teach the central government a lesson ‘through ballots’ as the centre was releasing the Teesta waters to Bangladesh and thereby depriving the people of north Bengal of their own natural resource. For Modi, who is known to have strong opinions and whom opponents criticize as a divisive figure, the deal and statements made around it demonstrate that he is capable of great diplomatic feats, succeeding where a multitude of predecessors failed. He also showed remarkable balance and sensitivity to various stakeholders, including political rival Banerjee, impressing many doubters. India will open two new consulates in Sylhet and Khulna in Bangladesh, while Guwahati will see a new Bangladesh consulate in the coming months. Narendra Modi also accepted an award honoring former Prime Minister Atal Behari Vajpayee for his support of the Bangladesh liberation movement as a member President of the Bharatiya Jan Sangh and member of the Lok Sabha.